We have exciting news to announce for 2017 – a whole new look for our company! For starters, we have completely re-designed our logo to give it a fresh and modern feel. The design has a handful of influences we’d love to share with you. First, we wanted to include a nod to our original logo and Daniel’s roots in lighting concerts (our previous logo was a concert lighting fixture). Upon lots of brainstorming we came up with the idea that a prism, as seen on Pink Floyd’s Dark Side of the Moon, was a great reference to both concerts and lighting. Second, we wanted to make sure to indicate that we did electrical, so we styled the yellow ray of light as a lighting bolt. And third, we wanted to highlight our pride as a local Colorado business, so we made our “prism” a simple mountain design. We hope you like it as much as we do! 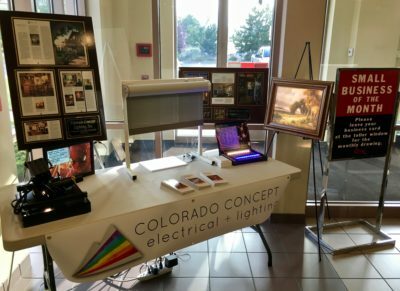 We have also updated our name from Colorado Concept Lighting to Colorado Concept Electrical + Lighting to make it clear to both current and prospective clients that we are not simply a lighting company, but full-service electrical contractors. Next, if you are reading this, you can see we have launched a brand new website. Our old one was very outdated, to say the least. Our new website is designed to truly showcase the beautiful and high-quality work we do, better explain our services, and make it easier for clients to get in contact with us. Finally, if you’ve had us to your job in the last few weeks, you might have noticed our upgraded company vans. Our new vehicles are smaller, more efficient, and showcase our new branding wonderfully. We want to say thank you to all our customers who have been part of our 33 years of business and we look forward to sharing this new chapter in Colorado Concept’s history with you. Home » News » New Branding, Website, & Vehicles!